Explore the sights and sounds of Philadelphia on board a double-decker, hop-on hop-off bus tour. Visit 27 of the city's top attractions, as a local guide offers live commentary on the points of interest and landmark locations along the way. Popular stops include the Betsy Ross House, the National Constitution Center, the Liberty Bell, Independence Hall, and many more. Then, see the sights illuminated against the evening sky on the guided, 2-hour, 'Philly by Night' bus tour. Discover one of the most historic cities in the US on a hop-on hop-off sightseeing tour of Philadelphia. Experience the city's sights and sounds with 360-degree panoramic views. This hop-on hop-off tour departs from the northeast corner of 5th and Market Streets. Board an open-air, double-decker bus at any of the 27 stops around Philadelphia. Along the way, enjoy live narration from the tour guide, who will share interesting stories and facts about the city's most popular attractions and historic landmarks. 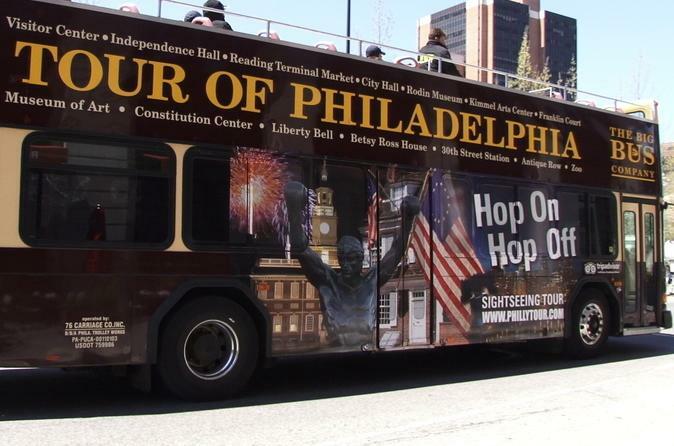 This hop-on hop-off sightseeing tour allows passengers to customize the itinerary and experience Philadelphia's history, heritage, and culture at their own pace. Some of the stops include the Independence Visitor Center, the Betsy Ross House, the Philadelphia Mint, Ben Franklin's Grave, the National Constitution Center, Chinatown, the Reading Terminal Market, City Hall, Love Park, and many more. Following a return to the northeast corner of 5th and Market Streets — and a dinner break — climb aboard the popular 'Philly by Night' bus tour to see the city illuminated under the evening sky. This sightseeing tour begins at the Philadelphia Marriott Downtown, located on Market Street, a 1-minute walk from Reading Terminal Market. The bus leaves at 8pm and the suggested boarding time is 7:30pm. 'Philly by Night' is not of the 'hop-on hop-off' variety, but passengers will have the opportunity to climb the famous Rocky Steps at the entrance to the Philadelphia Museum of Art and to take pictures of the city's nighttime skyline. Enjoy live narration from a tour guide/host, who will share interesting stories and facts about one of America's oldest cities. Along the way, visit Penn's Landing, South Street, the Liberty Bell, Independence Hall, Chinatown, the Avenue of the Arts, the Ben Franklin Parkway, the Philadelphia Museum of Art, and much more. The tour ends back at the Philadelphia Marriott Downtown around 10pm.